ON THE 5TH OCTOBER 1945, Konrad Adenauer, then Mayor of Cologne, later West German Chancellor, was asked by a representative of the News Chronicle and the Associated Press (Barbara Page) what he thought of the Franco-Belgian proposal for a Rhine-Ruhr state. He said that in his opinion it would be wrong to separate a Rhine-Ruhr state from the rest of the non-Russian occupied regions of Germany, and that it would be necessary to link the economy of the whole of the non-Russian occupied regions of Germany with the economies of France and Belgium, so that common economic interests would arise. At that time, the four-power administration was still functioning reasonably well and most Germans believed that the unity of Germany had to be preserved at all costs. Adenauer had realised, however, that as long as the Soviet occupation power was in a position to influence the whole of Germany, within the framework of the four-power administration, German imperialism could not be re-established. In such a situation, the reforms carried out in the Soviet-occupied zone represented a very real threat to the future of Germany as envisaged by the Western imperialists. Adenauer was much encouraged by Churchill's speech at Fulton in March 1946, which clearly signalled the opening of the cold war against the Soviet Union. In the autumn of the same year, the American Secretary of State, James Byrnes, paid a visit to West Germany. In a speech made in Stuttgart on the 6th September, he announced that it was the intention of his government "to unite the economy in its own zone with one or all of the others who are ready to do so." The British government had already agreed to this. On the 2nd December 1946, an "Agreement on Joining the British ,and American Occupation Zones" was signed in New York. It came into force on the 1st January 1947 and established the so-called "Bi-zone" as the first step towards a separate West German state. Six months later, a "bizonal economic council" was formed in Frankfurt-on-Main. On the 6th June 1947, a conference of prime ministers of all the provinces of the occupied zones was held in Munich at the invitation of the Prime Minister of Bavaria. The prime ministers of the five provinces in the Soviet o~cupation zone attended and tried to raise the subject of "the formation of a central German administration, through consultation with the democratic parties and trade unions, and the establishment of a united German state." It was ruled out by the West German majority. The five prime ministers from the Soviet occupation zone returned home. About this time, the American Secretary of State, George Marshall, announced his aid programme for Europe. This so-called aid, of course, was conditional upon an anti-Soviet and anti-Communist attitude. Those who accepted Marshall "aid" had to give up their independence and renounce their right to self-determination. On the 7th June 1948, the foreign ministers of the USA, Britain, France and the Benelux countries took a joint decision to set up a West German government - and stated that no peace treaty would be concluded with Germany but that an "Occupation Statute" would be issued and that foreign troops would remain on German soil for an unlimited period. Eleven days later, on the 18th June, the American, British and French military governments issued a joint ordinance "concerning the re-organisation of currency matters" in their respective zones. This ordinance announced that in three days time, the Reichsmark currency, then in circulation throughout the whole of Germany, would be replaced by a new Deutschmark currency in their three zones. In the three Western-controlled sectors of Berlin, a new special currency (the "B" mark) would be introduced. The new money had been secretly printed in enormous quantities in the USA. 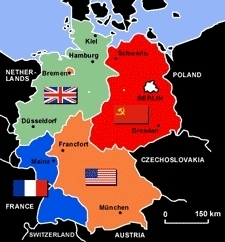 This action of the Western powers not only threatened to split Germany, in terms of money and finances, but also Berlin, situated in the centre of the Soviet zone. Faced with this new contravention of the Potsdam agreement, the Soviet military government was forced to take similar action. As no new notes had been printed for the Soviet zone, the old notes were revalued by means of postage stamps pasted on them. Steps were also taken to restrict traffic in order to safeguard the normal economic life of the Soviet occupation zone and the Soviet sector of Berlin. It was obvious that guarantees were needed against the use of normal traffic for illegal currency and black market trading operations. Restrictions were therefore introduced by the Soviet authorities on the 19th June to prevent their zone from being flooded with devalued banknotes from the Western zones; but never at any time did the Soviet administration place any restrictions on freight traffic. On the 24th June, however, the Western powers stopped the entire freight traffic from west to east and set up an airlift. Instead of West Berlin receiving its food and other supplies from the surrounding Soviet zone, it was £orced to get its £ood by air at enormous cost. and that all talk of "starving out West Berliners" was pure invention. All the restrictions imposed upon them were solely due to the attitudes taken by General Clay, military governor and commander-in-chief of the US zone, and by his British counterpart. The airlift, which had been set up on the 24th June, continued until the 30th August, when the four powers reached an agreement which provided for the introduction of the Deutschmark of the Soviet occupation zone as the only currency in Berlin; the establishment of four-power control of all financial measures in Berlin; and a discontinuation of the traffic restrictions between Berlin and the Western zones of Germany. There was dismay in the capitalist press at what the social-democratic Telegraf called "the abandonment of Berlin, through the introduction of East currency, to the political forces behind it." In less than two months, the Western powers had repudiated the agreement, allowing the so-called "blockade" to continue until May 1949. The airlift is said to have cost the people of the Western occupied zones of Germany more than a hundred million marks. According to the January 1949 issue of US News & World Report, "the real reason for the air-lift" was to get "bigger profits for the aircraft factories and oil companies of the USA." In reality that was just a spin-off. General Clay came nearer the truth when he talked of the invaluable experience that had been gained in the use of air transport for military and civilian purposes. The Times described the airlift as a strategic manoeuvre that had completely revised all previous notions about the possibility of flying in supplies in wartime. On the 1st July 1948, while the Berlin crisis was still on, the military governors of the Western zones handed the prime ministers of the provinces in their respective areas the directives that had been worked out in London. As a result of this manoeuvre, a con- stituent assembly met on the 1st September. Of the 65 deputies delegated from the provincial parliaments, only three were workers - two Communists and one Social-Democrat. Max Reimann, one of the Communists, created an uproar by moving that "discussions of a separate West German constitution cease." The motion was rejected and Adenauer was elected President of the Parliamentary Council. On the 8th May 1949, a Basic Law was adopted by the Parliamentary Council by 53 votes to 12. At no time did the people of the Western zones of Germany have an opportunity of discussing and voting upon the constitution. At the Paris meeting of the Council of Foreign Ministers, on the 23rd May 1949, the Western powers rejected all Soviet proposals for the re-establishment of Germany as one country in the spirit of the Potsdam agreement. On the 14th June, while the Paris Conference was still in session, the prime ministers of the provinces in the Western zones proclaimed the electoral law for the Bundestag. Elections were held on the 7th September and the Bundestag met in Bonn on the 15th. Adenauer was elected Federal Chancellor with a majority of one vote - his own. And so the West German state was founded - in complete disregard of the right of self-determination of the German people and in violation of the basic principles of the Potsdam agreement. On the 21st October, Adenauer described the Federal Republic of Germany as "the only legitimate state of the German people" and asserted that it alone was entitled to speak for the whole of Germany. By now, West Berlin had been separated from the Soviet zone and turned into a front-line city with a special status.